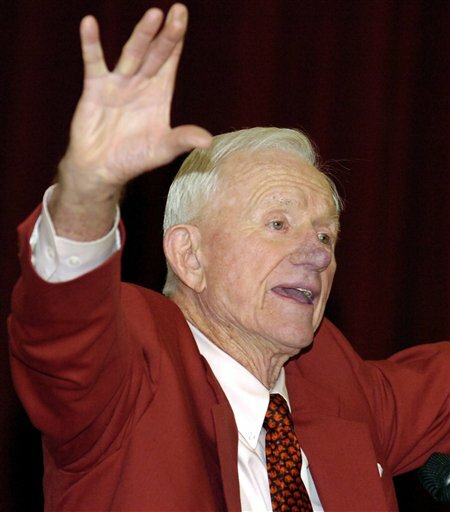 Frank Broyles, who has spent nearly 50 years as football coach and athletic director at Arkansas, will retire at the end of the year. Broyles addressed a meeting of the university's trustees Saturday, ending days of speculation about his plans. "I have notified Chancellor (John) White of my decision to retire as director of athletics, effective at the end of the calendar year. This is not an easy decision after 50 years but a choice that I feel is the best," Broyles told the board. "It's been a Razorback miracle that I've witnessed and the fans of Arkansas deserve all the credit." Dallas Cowboys owner Jerry Jones, who played for Broyles, addressed the crowd gathered in the ballroom at the Arkansas Union. Among others attending were football coach Houston Nutt, defensive coordinator Reggie Herring, basketball coach Stan Heath and track and field coach John McDonnell. The meeting room was decorated with red and white balloons and banners, one of which said, "Thanks Coach." "I can tell you from being in the business, he's irreplaceable and he's still 'got it,' and for this state, for this university, I hate to see that diminish in any way," Jones said. The 82-year-old Broyles told the crowd that from his first day with the Razorbacks, he began every speech by saying what a privilege it was to represent the university and he began the same way Saturday. Chancellor John A. White told the gathering that he has asked Broyles to remain as a consultant to the university. Nutt said Arkansas would miss Broyles. "Sometimes you don't realize what you have until he's gone," Nutt said. "I think that's what you'll see. You'll find out." Broyles, a three-sport star at Georgia Tech, was the coach at Missouri in 1957 before being hired as Arkansas' coach. He held the post until 1976, and became Arkansas' athletic director in 1974. He finished with a 144-58-5 record as a head coach and was inducted into the College Football Hall of Fame in 1983. His most memorable season was 1964, when the Razorbacks went 11-0 and were named national champions by the Football Writers Association of America. That season was part of a school-record 22-game winning streak that didn't end until the following season in the Cotton Bowl. As athletic director, Broyles guided the Razorbacks out of the Southwest Conference and into the more lucrative Southeastern Conference in 1991, and he's frequently picked winners when selecting coaches. Nolan Richardson and Eddie Sutton have coached the Arkansas basketball team while Broyles has been athletic director _ and Lou Holtz succeeded him as football coach. In 2003, Broyles took over as chairman of the school's Campaign for the 21st Century, which ended in 2005 after meeting its $1 billion goal. Arkansas' sports facilities _ from its football stadium to its recently completed outdoor track _ are considered top-notch. While he was coaching, Broyles became famous for hiring top assistants. More than 25 of them eventually became head coaches, including Joe Gibbs, Jimmy Johnson, Johnny Majors and Jackie Sherrill. The Broyles Award is now given each year to the nation's top assistant football coach. Broyles' tenure has not been without controversy, of course. Sutton, who left in 1985, has talked of a spat with Broyles that sparked his departure _ and Richardson's firing in 2002 was even more acrimonious. Richardson, who coached Arkansas to the 1994 national championship, sued the school, claiming he was fired because he is black and because he exercised his free-speech rights. U.S. District Judge William R. Wilson Jr. ruled in June 2004 that Richardson failed to prove discrimination, and a federal appeals court later upheld the firing. In 2003, Broyles was given a five-year contract after speculation about whether he would be reassigned or asked to resign. Also, there has been plenty odebate in recent years over how many home football games should be played in Little Rock. Last season, the Razorbacks played in the state capital twice and the other six home games were in Fayetteville. Arkansas used to split games between the cities.